Deseed the red chillies and grind. Cook tomato pieces till tender and pass through a sieve. Cook tomato pulp, ground red chillies, chilli powder, salt, sugar, cloves, vinegar and mustard seeds till thick. Remove from the fire, take out muslin bag and cloves. Mix glacial acetic acid. Pour in a bottle and cork tightly. Keep it for one week before using. 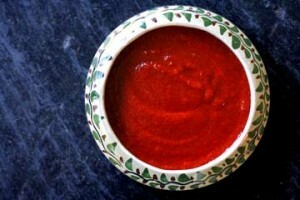 Note: If the colour of the sauce does not look good, mix with it 1/2 teaspoon tomato red colour.